The antioxidant properties of chaga mushrooms will transform your cup of Joe from an energizing treat to a healthy lifestyle choice! Coffee is so energizing because it stimulates the central nervous system and adrenal glands. When coupled with Lion's Mane mushrooms, recognized for their cognitive enhancing properties, coffee can be an outstanding productivity tool. 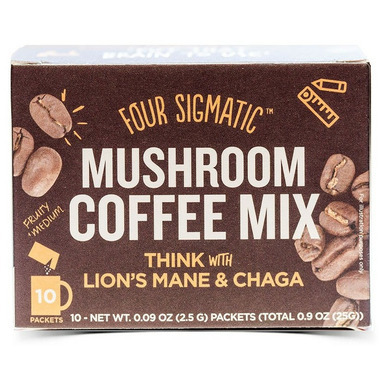 Four Sigmatic uses their renowned wild-crafted chaga mushroom dual-extract and lion’s mane mushroom extract in this coffee blend. They perform both hot water and alcohol extraction on their mushrooms, and standardizes the final product to have at least 30 percent polysaccharides (more than 15 percent beta-glucans) and 2 percent triterpenes. As always, these pure spray-dried extract powders don’t contain any sugars, fillers, or carriers. And they don't use caterpillars in the production methods, so this product is suitable for vegans. This premium instant coffee mix made with 100 percent Arabica beans, grown in the highlands of the Sierra Madre de Chiapas in Mexico. It is grown under the canopy of shade trees in rich, volcanic soil. After carefully roasting and brewing the beans, Four Sigmatic concentrates the coffee by evaporation, and finishes it off by spray-drying it into a pure instant powder. Four Sigmatic runs each coffee batch through a third-party laboratory to ensure the absence of mycotoxins. As with all of our products, we source the highest quality ingredients. Non-GMO, Sugar Free, Vegan, Paleo-Friendly, Allergen Free. WARNING: Consuming this product can expose you to chemicals including Acrylamide, which is known to the State of California to cause cancer and birth defects or other reproductive harm. For more information go to www.P65Warnings.ca.gov/food. Great tasting coffee. I love this product. A nice change from roasted coffee beans. Good coffee, I feel like this drinks lasts me well into the evening. Good taste. I only wish it had more in the packets. It is good,wish they added more coffee into the mix. Good as take along when you are out. I've almost finished my first box and really like this 'coffee' as I get health benefits and great taste without the usual coffee jitters. I definitely recommend this product! I was recommended this coffee by a friend so I'm still on the first box. That said, my first impression is very good! This coffee is smooth and tasty, and not at all bitter. Definitely worth a try! I really like the taste. It is perfect for taking to work. My absolute favourite way to start my day! Love this product! I bought a few of Four Sigmatic's products and love them all. Use them everyday! No different from just any instant coffe. Chaga/maga whatever else is in it had literally 0 effect on me. Just save your money and for the same price buy a lot more of... regular instant coffee. "cognitive-enhancing properties" of those mushrooms are nothing but marketing fiction. I drink this coffee everyday before school and it never fails! 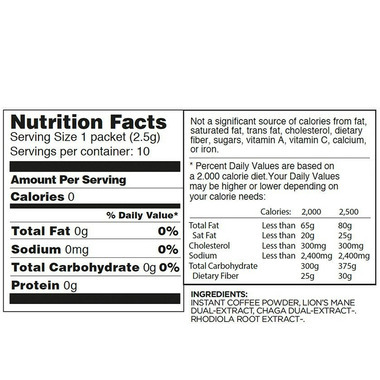 I am a very ADHD student and find this coffee with lions mane targets exactly that and helps keep me focused the entire day. After drinking a cup in the morning, I can accomplish double the tasks compared to without it. Highly recommend to someone who needs that extra boost to beat procrastination!! I can't say it changed my life, but I like it. Tastes like any instant coffee. I will buy this again! Tastes good! I love this product! It is easy on the digestive system, doesnâ€™t leave you feeling jittery, and actually does help improve focus! The taste and smell is different from your regular run-of-the-mill coffee, but I really like it. 100% worth the price, would buy again! Personally I think this has a great flavor and I definitely felt more alert, focused and in tuned this morning! This mix is not my favourite, but it does the trick. I have been decreasing my coffee intake for fertility reasons and I think this is a great substitute and Well has one of the best prices for this product. If you like roasted chicory coffee replacement type beverages you will love this one & of course mushroom coffee has definite health benefits & it's less expensive than most coffee shop coffees.